The morning after we arrived in Dubrovnik, K woke up with a persisting sharp pain and a large red inflammation in his big toe. Consulting with Dr Google (never a good idea!) we thought it warranted a visit to the local hospital for a formal diagnosis and treatment. Gout. My thirty-year-old husband developed gout. The diagnosis put a significant dampener on our plans to explore Dubrovnik as he had to spend most of our time in the city on the couch with his foot elevated! Still, we couldn’t be complete recluses as we needed to go to a pharmacy to get some ongoing medication to prevent further gouty breakouts in the future. We combined our outing with a visit to one of the few restaurants in the Old City that remains open during the tourism low season – Kamenice. It’s interesting to note that well over half of the restaurants in the area close between November and March, relying entirely on summer tourist trade to earn income for the whole year. Kamenice is one of the few that remains open, and I think it’s because they do a strong take-away trade for locals who want to take some freshly cooked seafood home with them. We started with the Octopus Salad to share – a refreshing mix of grilled (local) octopus with raw red onion, diced tomatoes, parsley, and lemon juice. 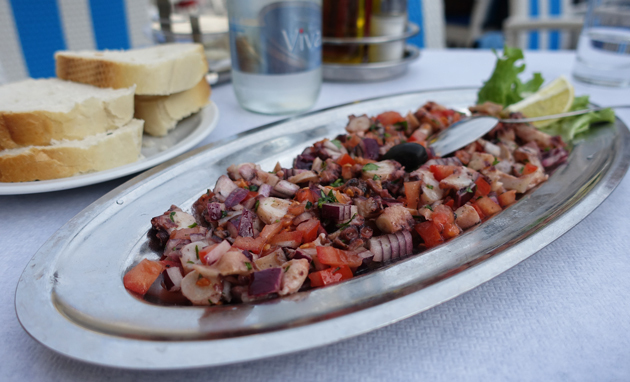 It’s a local specialty, one that I’ve seen on many menus of restaurants along the Croatian coastline because it literally is the perfect dish. The sweetness of the tomato offsets the sharpness of the raw onion, while the smoked tender octopus is enhanced by the sourness of the lemon – and it’s all topped off with a lingering freshness on the palate thanks to the parsley. It’s an absolute winner of a dish, and a perfect example of how a great dish doesn’t need a list of ingredients a mile long to be amazing. Simple is best. I chose the main dish of Mussels Bouzzara and in doing so, cursed K for developing gout as it would prevent us from splitting dishes as we had done in the past. As part of his new gout-friendly diet, he needed to cut back on eating red meat (no steaks), molluscs (no oysters or mussels! ), and to refrain from drinking alcohol and soft drinks. That meant that this whole platter of mussels cooked in white wine with garlic and parsley was just for me! 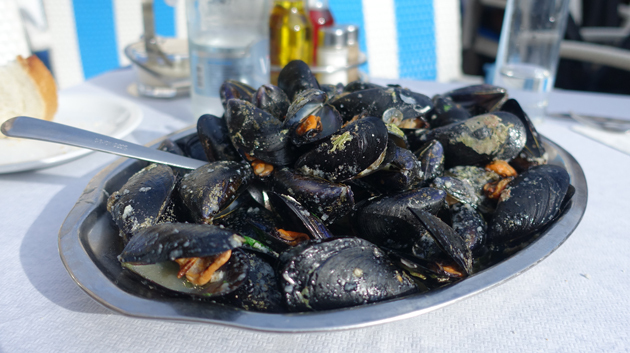 I loved the sauce that the mussels were cooked in, and took great delight in sopping it up with chunks of bread. However, I found the mussels a bit strange, in that almost 80% of them hadn’t been de-bearded before cooking – a large flaw in my book. It’s not that hard to do either. I don’t know whether it’s a local custom to leave them untouched, but it results in a less than pleasant experience as you end up trying to de-beard cooked mussels which is much harder than de-bearding an uncooked mussel! 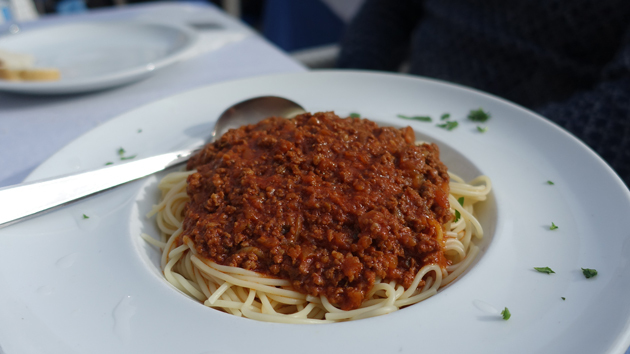 Shockingly, K ordered the Spaghetti Bolognese even after I told him to cut back on his consumption of red meat. “There’s hardly any meat in it,” he reasoned. “It’s mainly pasta carbs anyway”. He was proven wrong when this generous serving of meaty bolognese sauce on pasta was placed in front of him. There was more mince than sauce and I’m convinced that this dish delayed his healing process by another day. Still, he enjoyed this traditional spagbol so much, that I didn’t have the heart to tell him off too much. Kamenice is the type of restaurant you want to go to in fair weather – with only a few seats inside, they rely on the beautiful Dalmatia Coast sunshine to warm up the outdoor seating. Luckily it’s rare for the thermostat to drop below 10 degrees even in the depths of winter – it was a warm and balmy 17 degrees on the day that we went in February! 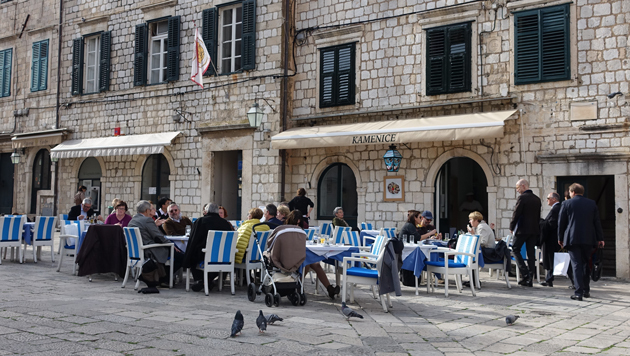 There’s nothing quite as good as eating freshly caught local seafood outside with the warm sun on your shoulders, and Kamenice is the place to go for that experience in Dubrovnik. Kamenice is located at 8 Gunduliceva Poljana, Dubrovnik. I wouldn’t bother sticking around at Kamenice for dessert or drinks, as they only offer two options – a creme caramel or fresh fruit. 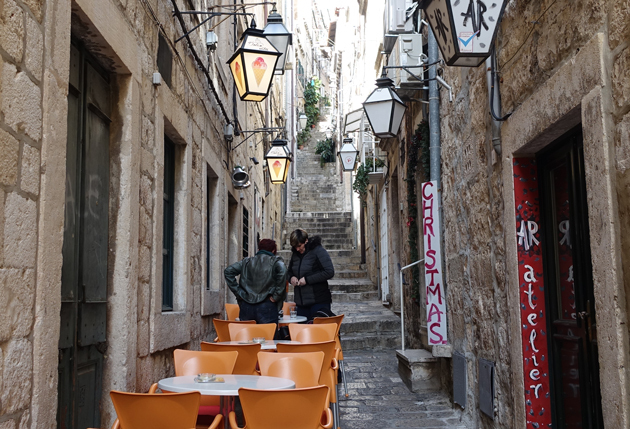 Instead, I suggest you pay your bill quickly and then head down the street to Dolce Vita, a little ice-cream and dessert bar in one of Dubrovnik Old City’s many narrow walkways. It’s a big favourite with the local kids after school – many younger kids will drop in to buy a scoop of ice-cream with their allowance money, and older kids will order pancakes then sit around and engage in awkward teenage flirting. K ordered the Chocolate and Cherry Palacinke, reasoning that “cherries are shown to help reduce the incidence of gout, so this is a gout-healthy meal”. That’s a bit of a roundabout reasoning given that the cherries were tinned not fresh, and there was more cherry syrup than actual cherries, but whatever works for him! 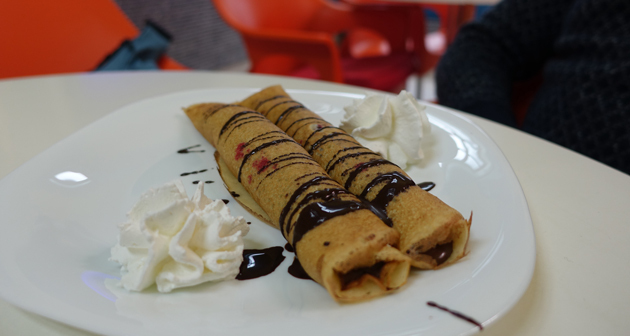 The palacinke were wonderfully springy and fluffy, and the the chocolate sauce rich and thick. 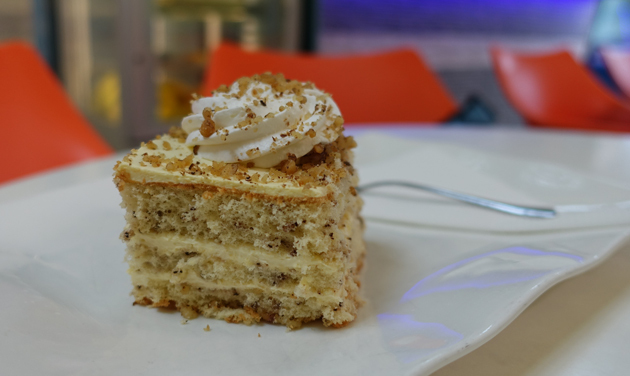 I chose for a simpler option after my button-bursting giant platter of mussels – a dainty Vanilla and Walnut Sponge Cake. The sponge was just as light as it should be, with a satisfying crunch every so often as you bit into a walnut crumb. Combined with the slightly tart almost lemony cream frosting, this was the perfect little slice of cake to satisfy a sweet tooth without putting too much pressure on my jeans. 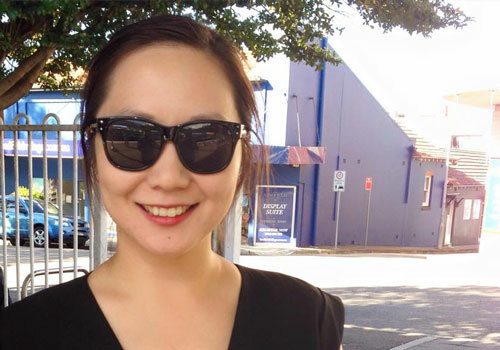 Drop into Dolce Vita for a sit-down dessert like we did – or even just drop in for a takeaway scoop of ice-cream. Either way, it’s a dessert destination in Dubrovnik that’s not to be missed! Dolce Vita is located at 1a Naljeskoviceva, Dubrovnik.